Winterize to Protect Your Pipes – Nothing is worse than a busted pipe causing water to leak out all over the inside of your home. During the cold winter months, pipes will freeze easily causing breakage and water leaks. One way to prevent this problem is to keep a small trickle of water running or at least a dripping faucet to keep water moving through the pipes making it less likely to freeze. A less wasteful option is to insulate pipes in areas of your home that are not heated. Pipes located inside cabinets underneath kitchen and bathroom sinks can get pretty cold so opening the cabinets can allow heat to warm the pipes, or you may want to insulate these pipes. Don’t forget to turn off all valves to outside irrigation systems and faucets. 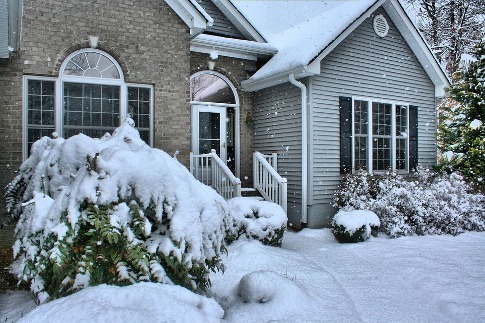 Winterize to Protect Your Roof – Leaves and debris collect on your roof and gutters all year long. When water freezes in a clogged gutter, you will have a mess that could back up and damage your roof. Keep downspouts clean so water can run out and be deposited at least 10 feet from your house. If you live in an area with heavy snow, be sure to rake off snow and ice to keep your roof from being damaged. Winterize to Protect Against Fires– Colder weather means more fires in wood stoves and fireplaces. Be sure to have your fireplace and chimney inspected to be sure they are safe. Creosote can build up inside the chimney and create a fire hazard so be sure to have your chimney cleaned and a chimney cap installed. Installing a quality set of fireplace doors to close after the fire is out is a good way to ensure no sparks will pop out onto your floor. Replace batteries in all your smoke detectors and make sure one is located on every level of your home. If you use an electric space heater, be sure to beep all fabrics and materials within a safe distance and unplug the unit when you are not nearby. Winterize to Save Money – Caulking around doors and windows can save you a bundle on your heating bill. Installing storm doors and windows is also a good way to ensure the heat stays in and the cold air stays out. Investing in a programmable thermostat is a good way to save on energy bills. These type thermostats can be programmed to turn down the temperature when nobody is home and warm up your home when your family is there. Winterize to Keep Safe from Carbon Monoxide Leaks– Odorless and dangerous, carbon dioxide leaks can cause real problems. Have your furnace checked out for carbon monoxide leaks and purchase a carbon monoxide detector from your local hardware store. Check with your energy provider to see if they will inspect your furnace for free or for a small charge. Winterize to Keep Tree Branches from Damaging Your Roof– We all love the shade of trees around our home during the spring and summer months but with colder weather comes ice and snow that can weigh down branches and cause then to break and damage your roof. Have a tree service come to your home and inspect your yard for dead trees and branches that need to be trimmed or removed before colder temperatures arrive. Winterize to Keep the Perimeter of Your Home Safe– With the shorter days and longer nights of winter upon us, don’t be left in the dark. Make sure outdoor flood lights work properly and walkway lights are in good repair. Making sure walkways are clear and all light bulbs are replaced can ensure no one trips and falls. Extra outdoor lighting also deters burglars from breaking in your home. Sofia Robinson writes for HeatilatorFireplaceDoors.com. The home builders’ choice when it comes to fireplace and replacement doors.